With soaring ballads and exhilarating dance numbers, Aida leaves audiences moved and inspired by the power of love to transcend politics, war, and even death. Brilliantly brought to life by the renowned songwriting team of Elton John and Tim Rice (The Lion King), this legendary musical chronicles a star-crossed love triangle amongst Aida, a Nubian princess kidnapped from her country; Radames, the Egyptian captain who enslaved her people; and his fiancee Princess Amneris. As attractions intensify, Aida must choose between her heart's desire and her responsibility to lead her nation to freedom. Winner of four Tony Awards, including Best Original Score, Aida is filled with passionate storytelling, exuberant dancing and world-class staging and singing. See the classic tale of forbidden love when Constellation Theatre Company brings it to the stage of Source in Washington, D.C. "...Unfortunately the stage business, crowd scenes and attempts at Pharaonic pageantry all look artificial, and the actors frequently appear uncomfortable on A.J. Guban’s stylized river-and-pyramid-evoking set. Tony Thomas II’s choreography looks egregiously labored. In general, the creative team’s exertions seem to have aimed at creating a scaled-down version of Broadway-style grandiosity and pomp, when a better goal would have been to give this musical a distinctive conception that let it live and breathe in the intimate Source space. (Additional flaws in this staging, like the frequent inaudibility of lyrics, and a turban frond that hid a key character’s face while he was speaking, seem the result of haste and sloppiness.)" "...But, despite that initial buzz of visual pizzazz, Aida (}} and a half) gets off to a sleepy start with two numbers introducing the love story of the Nubian princess Aida and the Egyptian army captain Radames, who captures her in war. Though Aida conceals her royal lineage from her captors for her own safety, she cannot hide her unbreakable spirit. That indomitability resides fully in the confident voice of Shayla S. Simmons, whose portrayal of the headstrong highness Aida is this production’s most compelling element." "...As for the company's latest offering, Elton John and Tim Rice's Aida, the question becomes whether or not it's possible to take a large-scale musical with a big story, sweeping score and - at least on Broadway - a grand production design and strip it down so that it works just as well (if not better) in a black box theater. Upon seeing the show, I would suggest the answer is both yes and no." "...Director Michael J. Bobbitt, Musical Director Walter “Bobby” McCoy, and Choreographer Tony Thomas II have together triangulated a compelling production with a first-rate cast of actor-singer-dancers and a band so well balanced by Sound Designer Roc Lee that we hear every musical nuance, every emotional note." "...Star-crossed lovers facing a destiny unknown is a story that seems to never get old, and the current revival of Elton John and Tim Rice’s moving musical “Aida” by the Constellation Theatre Company is proving to be a powerful production packed with plenty of raw, tender moments." "...Every story, new or ancient, bagatelle or work of art…all are tales of human failing…all are tales of love at heart. 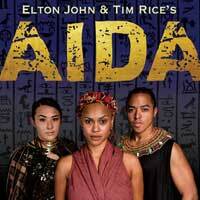 The Gods love Constellation Theatre Company for spinning their storyteller’s thread into a musical theatre masterpiece production of Elton John & Tim Rice’s Aida. A staggeringly powerful and stunningly beautiful production Directed by Michael J. Bobbitt with Musical Direction by Walter “Bobby” McCoy and Choreography by Tony Thomas II, Constellation’s Aida possesses the grandeur and potency of Broadway’s timeless love story and the daring familiarity of telling such a tremendous story in such an intimate space. Evocative, riveting, and filled with a colorful vibrancy that pulsates through each moment of the show, Aida is a refreshing breath of reality in its own tragically beautiful way amid these tempestuous times in the nation’s capital." "...Aida’s strength is in its songs (its dialogue can run ham-fisted; luckily, there isn’t much of it), and Constellation’s production lets the audience focus on the music (though occasional issues with microphone balance sometimes had one singer drowning out another during duets and trios). Aida, based on Verdi’s opera, is ultimately a tragic play, and the responsibility of occasional comic relief rests on the shoulders of Werely, the fashion-conscious princess strutting her way through the runway-esque “My Strongest Suit” (a routine that proves a great showcase for Kenann M. Quander’s glitzy costumes)."